*This post may contain affiliate links. Even though I may make a commission, all recommendations are my own. If you are planning to start paying off debt, then the first thing you have to do is make sure that unexpected financial surprises don’t blindside you and set you off track. To prevent these minor issues from coming up, Dave recommends starting with an emergency savings of $1,000. If you already have this much in savings, great, that means you’re ready to move on to Baby Step #2! Maybe you aren’t even close to having $1,000 in your savings, don’t stress it, I’ve already created a post to give you some ideas on how to get there quickly! Should you have to dig into this fund, be sure to build it back up again by putting debt payoff on hold! Welcome to the longest of Dave Ramsey’s baby steps folks. Not only is this often the longest step because people have so much debt to pay off but also because most of the time, it’s no fun. Working hard for money every month only to give it all to corporations that are charging you interest for things you don’t own yet isn’t exactly exhilarating. While most of the time it can be a slow, long process, sometimes you have moments of triumph. This month we were able to pay $1,200 in one week toward our debt and it felt awesome. Seeing your debt disappear gives you that boost to keep going. It reminds you what you’re working toward and it can be really exciting to see yourself inch closer and closer to your goals. If you’re a visual person like me, check out my Fun Sized Budget Bundle. There are printouts to help you easily keep track of debt payoff and set goals too! The hardest part of this step is just sticking with it. When you want to go out to dinner with friends, but you have to turn them down, it seems like paying off debt will never end. As you browse everyone else’s vacation photos on Facebook, it can make you feel like giving up. Don’t do it. Baby step #2 is tough sometimes, but it is worth it. Every month I was making big payments toward our biggest credit card debt, yet it seemed like our total was never going down. Finally, I started looking at the interest payments and I was furious. Most of my hundreds of dollars were going directly toward the interest on the card! No wonder we weren’t getting anywhere. With an interest rate of 25% (roughly) it felt like we were just treading water and going nowhere with our payments. We decided to take out a loan in order to get a significantly lower interest rate. Our monthly payment stayed about the same, but our total owed actually went down each month and we have been able to pay it off faster! You can easily apply for a lower interest rate with The Loan Exchange online! To avoid paying money toward your interest, make sure any additional payments you make each month are going toward your “Principal” payment. This will help get your total amount owed down faster. How to Have No Money at the End of the Month and Why That’s a Good Thing! Hooray!! Baby Step #3 means your money is your money again! After paying off debt, now is your chance to start building up major savings for yourself. This 3-6 months worth of savings is designed to help you pay cash for things that go wrong (car repairs, medical bills etc) but to also give you a safety net should you lose your job or fall into another type of hardship. To get an idea of how much money you should set aside in your emergency fund start by tallying up your total monthly expenses. This amount is usually between $15,000-$20,000. So how do you even start building this wealth? My suggestion is just continuing on with what you had previously been doing to pay off debt. Use some or all of the amount you were putting toward debt to begin putting toward building your 3-6 month emergency fund. Where should you keep these savings? As far as the best account to keep your savings in, I would recommend opening a Savings Builder account with CIT Bank. The Savings Builder account has a minimum deposit of $100 per month and has an amazing interest rate of 2.45%! Dave Ramsey’s 4th step is investing. This includes a 401K or other investment programs through work. Dave makes it clear that this step is one many people struggle with. It’s hard to let go of that retirement fund while you work to pay off debt and build an emergency fund but it will help you stop paying interest faster and start building your safety net quicker. Then when you begin investing again, you’ll be able to contribute more and spread it around in different types of investment accounts. In fact, I recently tried my hand at spare change investing and can invest very little but still have a great projected profit. 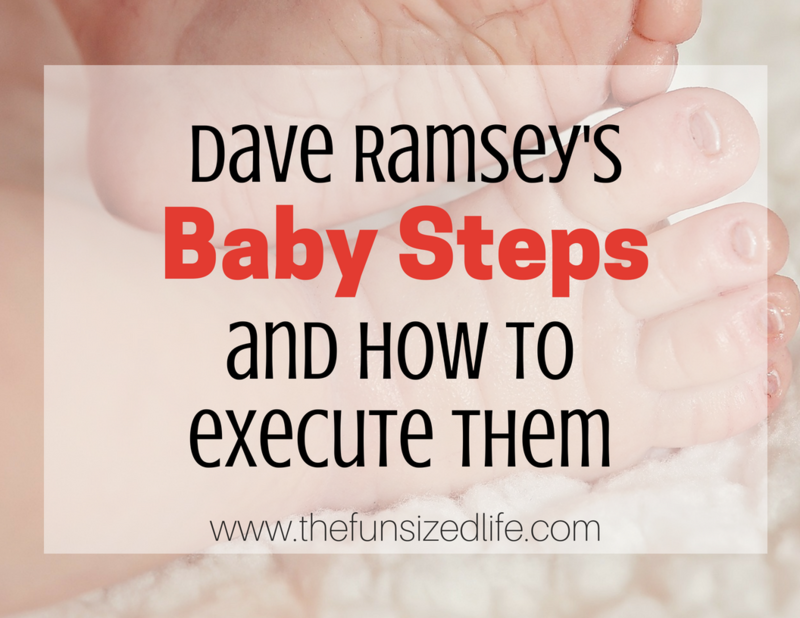 WARNING: If you are still on baby steps 1,2 or 3, do not stress about this step (or the future ones) too much. It will do you no good. Pay attention to what you need to know right now. The rest will come. Diversify your investing. – Do not invest in only one account or one company. Invest at least 15% of your income in Roth IRAs and pre-tax retirement plans. Use tax-favored plans – this investment comes with a qualified plan or has special tax treatment. Roll over – Always roll retirement plans into an IRA if/when you leave a company. Do not bring the money home it will be taxed. Fund a 401K to whatever your employer matches! Once you have paid off debt and started building wealth, Dave gives the go-ahead to start saving for your children’s college funds. I think this is a step many parents start doing while they are in debt. Parents just want to do what is best for their children, it makes sense. However, taking care of you and your finances first is one of the best moves you can make for your kids. Everyone wants to be able to help their children afford a good education, but create a financially solid home first. Encourage your children to work while in school. Studies have shown they do better in school and financially! Baby Step #6: Pay off the house early! This is an absolute DREAM of mine! Dave Ramsey’s recommendation is getting into a house with a 15-year loan. We didn’t do this right away but are hoping to refinance at some point! After researching what it takes to pay a mortgage off early, I have realized that there are a lot of ins and outs to it! Sometimes you can even get charged a fee for paying off early! Since I personally don’t have a ton of advice in this department (not yet at least) I will tell you what Dave Ramsey recommends. Your monthly payment should be no more than 25% of your take-home pay! Like I said, if you’re on Baby Step 2, there is no need to worry about 4,5 and 6. Worrying will only stress you out and slow you down. Your mission is to be as awesome as you can on the step that you are on! Love those baby steps! We finished off #6 six months ago (after working the steps for a few years) and it is AMAZING. Totally worth sticking with the plan. I love your advice; they really are called baby steps for a reason, and they work!! Ahhh I am soooo jealous! We took a break from baby step 2 (ughhh whyyy) otherwise we’d totally be done by now! BUT we’re so close to being done I can taste it! Thanks for the quick summary. Really good advice. Thanks so much! They changed my life so I have to spread the word!